I viewed your book, “Common Core Money: Financial Literacy for Educators & Other Professionals” on Amazon. 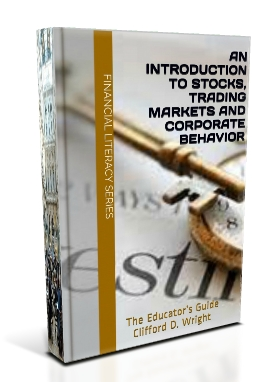 I have written a similar title: “An Introduction to Stocks, Trading Market and Corporate Behavior: The Educator’s Guide". I also have a background as an educator, teaching math, and have a commitment to providing a new generation a higher level of financial literacy. Please consider reviewing my book. I have included a pdf attachment of the guide, as well as a link to the book on Amazon. Lack of financial knowledge is not only an economic consideration, but also a social concern garnering greater attention from school administrators, governmental agencies and policymakers. This concern highlights the fact that widespread gaps in levels of financial literacy exist, and at risk are those who are least familiar with complex savings and investment vehicles, and with financial planning concepts and their long-term benefits. Financial education is a fundamental building block for life, and the need for greater financial knowledge is underscored by the challenges stemming from current social and economic conditions. And while basic knowledge of personal finances has always been crucial to the attainment of goals such as the purchase of a home or saving for retirement – recent economic events have deepened the need to increase our knowledge of financial concepts as a safeguard against instability, and for maintaining overall financial well-being. An important headline today is the state of the global economy. For example, when taking into account the magnitude of the 2008 “Global Financial Crisis’’ – what many scholars and economist consider the worst financial, economic and social crisis since the ‘Great Depression’. Or, the fact that what started as a debt crisis in Greece in late 2009 evolved into a broader economic and fiscal crisis through-out the entire Europe and the world – and where issues pertaining to Greece remain in the headlines today – it becomes clear that it is more important than ever to be knowledgeable about the consequences of our financial decisions, and to empower ourselves with greater financial knowledge. To underscore this point, a key message that continually emerges in the news is that even in an era of record stock market growth, the processes that have shaped inequalities around the world continue to persist. Addressing these issues are crucial challenges, and continued analysis and discussion will provide useful input for dialogue and change. Nonetheless, the degree of choice requires the knowledge to evaluate the options, and the ability to identify those that best suit individual needs and circumstances. As educators, let us deepen this discourse by looking beyond basic economic indicators, and underscore the value propositions for financial literacy. Underpinned by our sound experience and expertise, we can deliver effective financial literacy programs which will help educators impart knowledge, and will empower our youth with the skills that are necessary to successfully manage their personal finances, and make better-informed decisions that will contribute to a sound lifestyle during working years and through-out retirement. As a course of action, school administrators and educators who design, implement and assess directives at improving social progress will find this book valuable in the classroom. In addition, academics whose insights are pertinent to the broader debate on development, and who share the belief that it is important to empower individuals will also benefit from this guide.